1) How to qualify for each of these competitions. 2) What are the general and tie-break rules. - To qualify, your club has to finish the League in the top 4. Beginning next season your club will be added to a CL group. - Winning the CL trophy automatically qualifies your club for the CL next season! - Winning the SL trophy will qualify your club for the CL next season as well. - To qualify, your club has to finish the League competition between 5th and 8th spot. - If you get knocked out as 3rd in the Champions League group phase, you will automatically qualify for the Knock Out phase of the Super League for the current season (at the 16th finals)! There are two phases in each of these competitions: The Group phase and the Knockout phase. Rules are absolutely the same in both competitions. Both CL and SL start with 32 teams spread across 8 groups, each consisting of 4 teams. The top two teams in each group qualify for the Knockout phase of the their respective competitions. NOTE: When it comes to the Champions League, the team that placed 3rd in the Group phase does not proceed further, but that team will be placed in a Super league competition's Knockout phase. 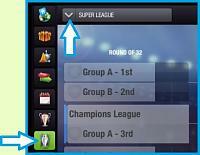 When two or more teams in the group phase are equal in points their spot will be decided under the following criteria. Please keep in mind that you have to check the statistics achieved through matches that heve been played only between the teams currently in tie. Thus, you must calculate points, goals, and all other stats based only on the results of those matches. CL - The winner in each group plays against the runner-up of one of the other groups. The pairs compete against each other in a two-leg format. SL - The winner in each group plays against the runner-up of one of the other groups. Those that survive the round of 32 will play against one of the 3rd placed teams from the CL group stage (as mentioned before), in the round of 16. Tie-break rules - In case of a tie, the away-goal rule is king here. The team that scored more goals while being the away team, proceeds to the next stage. You can switch between the CL and SL competition table by going to the respective competition's menu and selecting the drop-down menu at the top left. You can view the rules of the competitions and find out how much cash each stage nets for a victory by selecting the blue encyclopedia at the top right of the screen. The Tutorial button located at the top of the newly opened window, will play a video tutorial about the competition, when selected. The tie-break rules are the very same that the UEFA uses! Check them out in our F.A.Q. and also on the wiki. The final match - Just like with the Cup competition, the final showdown of the Champions League and the Super League will always be played at a neutral stadium. Well, only thing left is to wish everyone the best of luck in the Champions League and the Super League! And of course the other competitions as well. talisman, CM-16, zeffri79 and 5 others like this. Nothing about being placed in a Champions League that is a level above you. For example level 21 team stuck in with all level 22 teams. Epix, Alessio Fitch and nikolgiorgos like this. I think the issue with CL draws with teams one level above you should be addressed. This is not fair, especially for people unwilling or not capable of buying tokens. Of course, it goes without saying that it takes the fun away. Bunzo, Zoran Iovanovici and nikolgiorgos like this. Zoran Iovanovici, cookizzz, Bunzo and 3 others like this. I 'm also here to spoil the party. 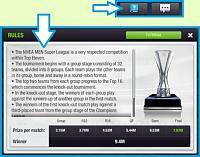 - We have improved the balance of levels in Champions League and Super League competitions. Last edited by nikolgiorgos; 01-05-2017 at 04:42 PM. Epix, HairDryer, madflo19 and 4 others like this. I'll speak for myself now. I am level 4 with a 101.8% (40.5) roster quality. I have already qualified for next season's CL and as a champion most likely. This season as a champion I was put in the CL with all the teams one level above me. More specifically there was a team with a roster which is rated at 139.3% (49.8) total quality (7 players with 8*!!!!). Now tell me if this is fair at all. It's Nordeus basically telling me you either have to buy tokens to be competitive or you have to tank for a couple of seasons which is something I never considered doing but very much fancy now. The cup was very balanced though, so I got to give you that. But, I'm not really sure if this wasn't just pure luck somehow. "Matchmaker" that´s easy for example a level 22 team plays in level 22 Champions League they do not play in level 23 or level 21 Champions league. It´s not rocket science is it ? Last edited by Bunzo; 01-06-2017 at 07:22 PM. Alessio Fitch, HairDryer, khris and 1 others like this. or if not enough teams just give a CL spot for the 5th...... man Ive been the last 8 or 9 CL editions playing vs +1 level teams there.... finished my strak at 13 CLs won of consecutive levels due that... despite I won some of +1 before but the main problem is the one we know... "market advantadge for some teams". Bunzo, madflo19 and Alessio Fitch like this. In a nutshell "Market advantage "